I didn’t discover eggnog until I was almost 30, but I now have a deep, deep love and appreciation for all things eggnog (and that’s even without the booze!). I’m not sure why it didn’t occur to me to try eggnog marshmallows until now, but I’m so glad it did because these are yummy. The most amazing part for me is that they go from a creamy yellow to bright white just like plain marshmallows, and I still can’t quite figure out how that happens! In the meantime, bring eggnog, sugar and corn syrup to a boil and continue stirring until it reaches 238 degrees on a candy thermometer (about 5 minutes). Whisk gelatin mixture on low speed, slowly adding the syrup by pouring it down the side of the bowl. Gradually increase to high speed and beat for about 12 minutes until thick and white. 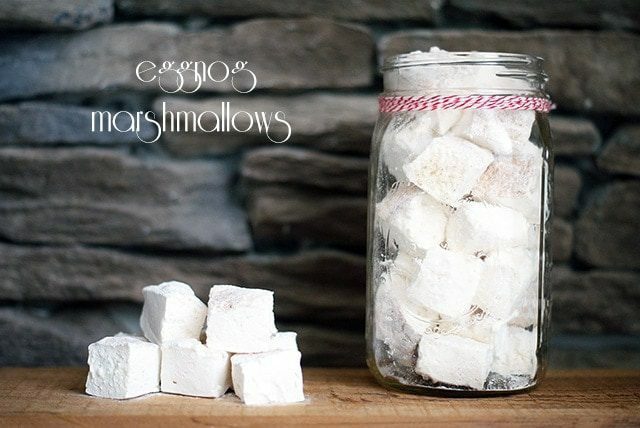 Toss the marshmallows in confectioner’s sugar. Once your marshmallow mixture is thick and white, turn the mixer to low and add a generous spoonful of spice to be swirled throughout the marshmallows rather than sprinkled on top.